Are you in the market for a motorcycle? Meet the Dagger, a 3D printed super bike created by Divergent 3D. The Dagger was introduced at this year’s Los Angeles Auto Show. But the bike isn’t made completely out of 3D-printed materials. Possibly the Dagger’s most important component for gearheads, its motor, comes from a Kawasaki H2 supercharged sportbike. At the moment, Divergent is focusing on employing the 3D printing tech for the Dagger’s structural parts. 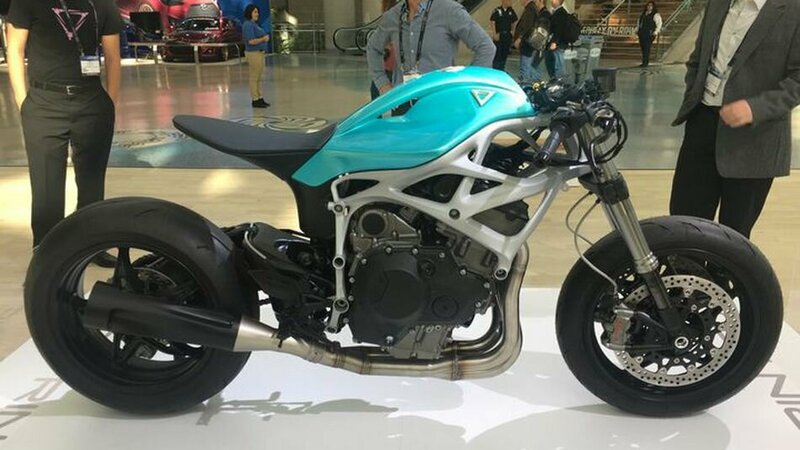 While there are other 3D-printed motorcycles already in showrooms (the APWORKS Light Rider and Energica Ego among them), the Dagger is the first foray into two-wheeled territory for Divergent 3D. That shift in strategy might actually be more important for the company than the bike’s actual performance, because the Dagger’s very existence shows how far the Divergent 3D manufacturing platform has come. “The ultimate vision is years from now because of lowered costs, we’re going to go from tens of car companies globally to thousands using this platform,” he said. Photo credit: Divergent Technologies Inc.